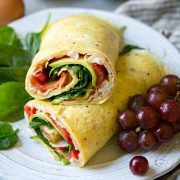 Homemade Crepes are a staple recipe! These are perfectly thin and tender, deliciously buttery and delicate and cooked to golden brown speckled perfection. Dust them with powdered sugar, serve with maple syrup or fill with fresh fruit and cream. The options are endless! A crepe is a very thin pastry typically served for breakfast (similar to pancakes) or dessert. They trace their roots to the Greeks and then after that to the French. If you visit France, be sure to visit the many crêperies that are found in Brittany (something I can’t wait to do!). 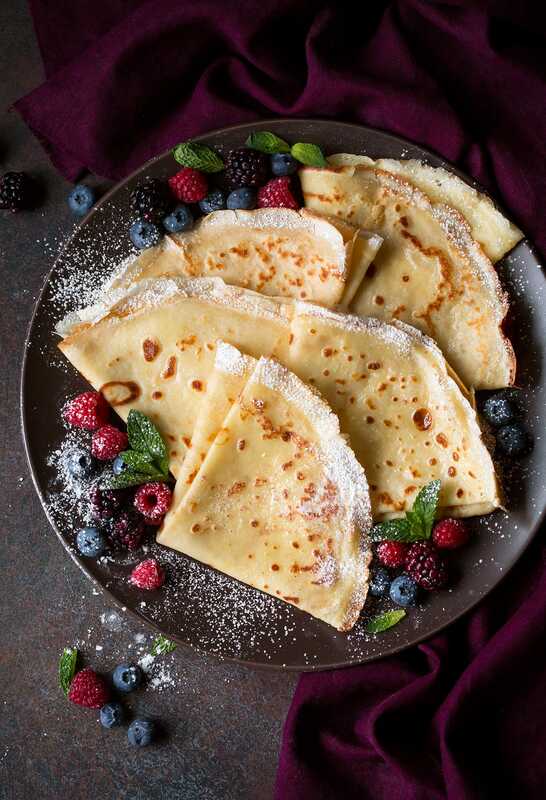 Crepes typically come in a sweet and savory version. (I’ve included a recipe for savory below). This is the ratio I like for crepes, 1 cup flour, 1 1/2 cups milk, and 3 eggs. Some may say it’s 1 too many eggs but they give the crepes a better overall structure/texture and they hold together better and aren’t tearing as much. I’ve tested with both 2 and 3 eggs, go for 3. Also why use water when you can use milk? It gives more flavor as does a hint of vanilla. For crepes my favorite method for mixing the batter is just to use the blender for a smooth lump free batter (plus bonus, it’s the fastest mixing method). Then to let the batter settle and to allow the liquids to saturate the starches you need to let the batter rest for 1 hour (in a rush 30 minutes will probably do). Do I Need a Crepe Maker or Crepe Pan? I’ve never owned a crepe maker or crepe pan so don’t worry about buying a special pan just to make crepes. Just a non-stick pan with a good non-stick coating will do (I just don’t recommend use a pan where the coating has started to wear off, the crepes may stick). What Ingredients go into Crepes? Milk – I like to use 2% milk here for the best consistency. Whole milk will work too I’d maybe add an extra tablespoon since it’s thicker. Flour – all-purpose flour works best here. Nothing too delicate and nothing too protein rich (which would make the crepes overly chewy). 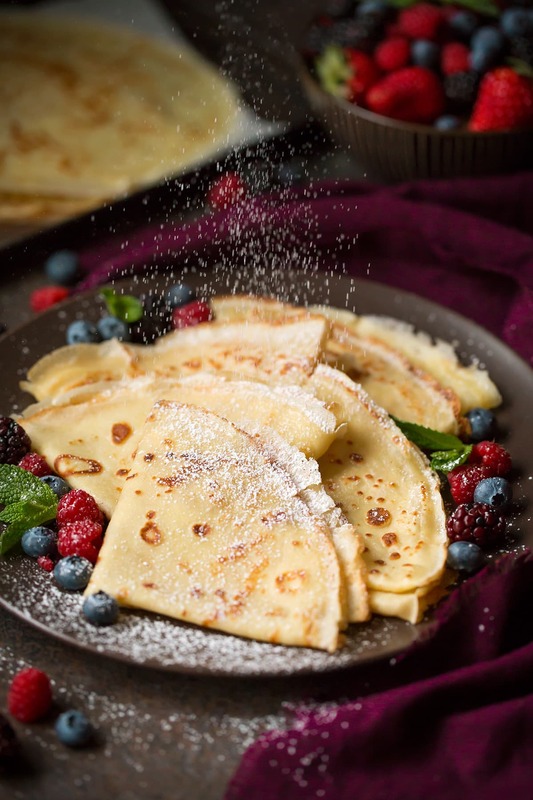 Sugar – this makes the crepes a little more tender and adds a hint of flavor. Salt – this brings out the flavor in the crepes so they aren’t flat. 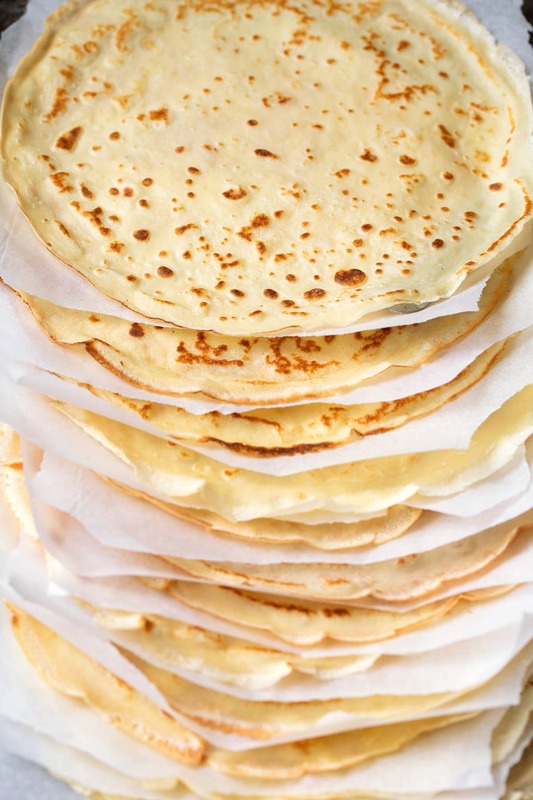 Butter – this makes the crepes rich and tender. Plus it prevents them from sticking to the pan. Vanilla – if you are making savory crepes you can omit this. Eggs – 3 offers the perfect amount of binding. How do You Make Crepes? Blend ingredients in blender: Add milk, flour, sugar, salt, butter, vanilla and eggs to a blender, then blend on low speed until well combined, about 10 seconds. Scrape sides and bottom of blender if there’s any flour sticking and blend a few seconds longer. Rest batter: Cover and chill 1 hour (or overnight if desired). Preheat skillet: Heat a 10-inch non-stick skillet over medium heat. Gently stir batter with a spoon just to blend separated layers. Pour batter into buttered skillet: Lightly butter skillet then lift pan and pour a scant 1/4 cup batter into pan, immediately tilt and swirl pan in circular motion to evenly coat entire bottom portion of pan with batter. Cook until set: Cook until golden brown brown on bottom then use an offset spatula to lift an edge of the crepe, grab the edge of the crepe with your fingertips and flip crepe to opposite side. Cook until golden brown spots appear on bottom. Repeat cooking process: Repeat until all of the batter has been used up (if needed reduce burner temperature slightly). Top as wrap as desired! Use a blender to mix the batter, this ensures thorough mixing and prevents lumps. Let batter rest at least 1 hour. This helps gluten develop leaving you with soft and tender crepes. Use a non-stick pan! And heavy bottom is preferred. This allows even heat and no sticking. Cook over medium heat. These are delicate and you don’t want to burn over a hotter setting. Use butter to grease the pan, butter equals better flavor vs. using oil or a non-stick spray. Measure out the portion of batter, that way your crepes won’t be too thin or too thick. You’ll have just the right amount of batter. Get ready to tilt and swirl! The pan will be warm so you’ll want to immediately start swirling around so the batter doesn’t just settle and cook in the middle. Serve them warm. 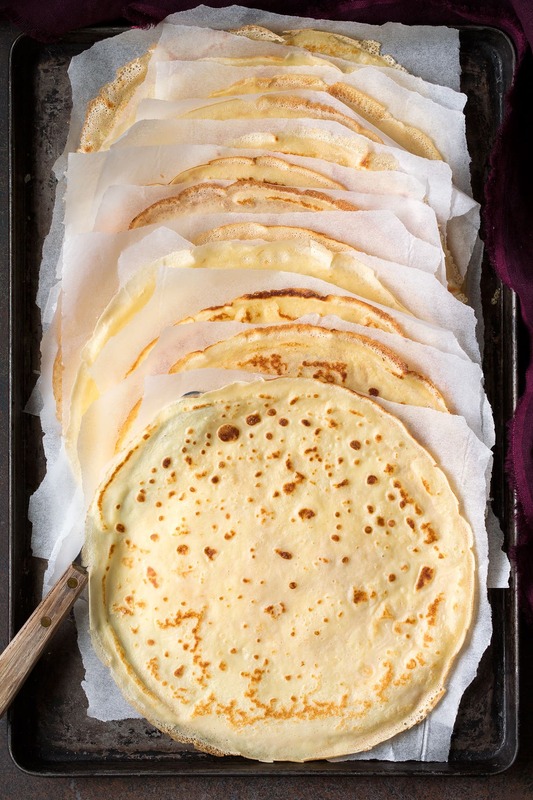 You can cover cooked crepes with a clean kitchen towel so they stay warm while you cook the remainder. I used to be too intimidated to try and make crepes but then one day I gave it a go, then of course I realized how easy it was and now I’m hooked. It really is a must have recipe! Try this recipe for yourself and tell me what you think in the comments below. 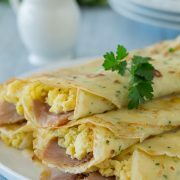 Do you think it’s the best crepe recipe too?? These are my idea of the perfect crepes. Perfectly thin and incredibly delicious! Can be made sweet or savory. 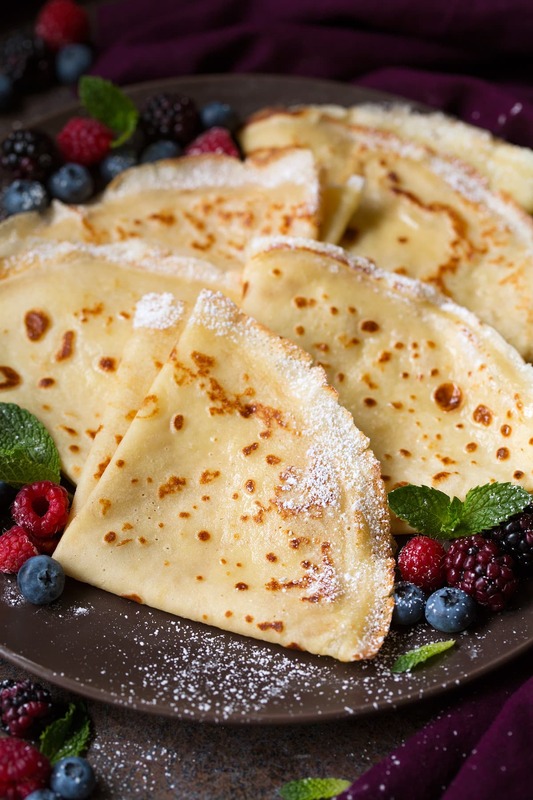 Dust with powdered sugar or fill with your favorite crepe fillings. Add milk, flour, sugar, salt, butter, vanilla and eggs to a blender, then blend on low speed until well combined, about 10 seconds. Scrape sides and bottom of blender if there's any flour sticking and blend a few seconds longer. Cover and chill 1 hour (or overnight if desired). Heat a 10-inch non-stick skillet over medium heat. Lightly butter skillet then lift pan and pour a scant 1/4 cup batter into pan, immediately tilt and swirl pan in circular motion to evenly coat entire bottom portion of pan with batter. Cook until golden brown brown on bottom then use an offset spatula to lift an edge of the crepe, grab the edge of the crepe with your fingertips and flip crepe to opposite side. Cook until golden brown spots appear on bottom. Transfer to a wire rack. Repeat until all of the batter has been used up (if needed reduce burner temperature slightly). 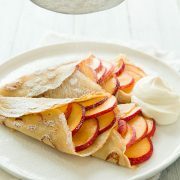 Dust crepes with powdered sugar and roll or fold into fourths, or fill with desired fillings then fold.